Coming to terms with a “new normal” and figuring out what your path will look like with illness in the picture is tough. It can be incredibly challenging to know how you’re supposed to begin to process all the changes happening in your life. That’s why we turned to our chronic illness community to better understand how to cope with this type of grief – because who understands it better than people who struggle with it themselves? If your illness has left you grieving, know you are most certainly not alone. Grief can be one of the most challenging aspects of living with a chronic condition, but when we face it together, it doesn’t have to be quite as scary. Here’s a breakdown of the topics and coping mechanisms we will cover in this piece. To navigate the article easily, we’ve included bookmarks of each section below, so feel free to click on the topic you find most interesting, and the link will take you to that portion of the article. Before you begin to process the grief you’re experiencing as a result of chronic illness, it can be helpful to recognize how this type of grief may differ from other types – such as the grief of losing a loved one or the grief of losing your job. 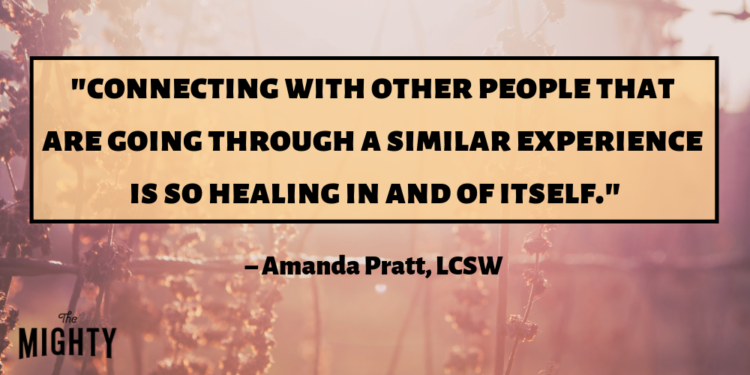 To better understand illness-related grief and its effects, The Mighty spoke with Amanda Pratt, LCSW, who both lives with chronic illness and works as a therapist for people with chronic illness. The problem with losing your health is that it’s a daily loss, not a one-time thing. No grief process is linear, clean and tidy, but you can expect to find some level of relief with time when you lose a loved one. But each day of living with a chronic illness is a reminder of the loss. All your friends are going out but you don’t feel well enough to? A reminder of when you could go out. Your grades feel the consequences of your brain fog when you used to be a straight A student? Another reminder of your limitations. Chronic illness by definition is lifelong – so each day that you wake up and face symptoms, side effects and limitations that can offer another reminder of your illness, and, potentially, another reminder of what you have lost. Pratt explained that the periods of ebb and flow many experience with disease flares and periods of remission can also bring up fresh feelings of grief over and over. For many, the course of chronic illness is often changing and unpredictable. 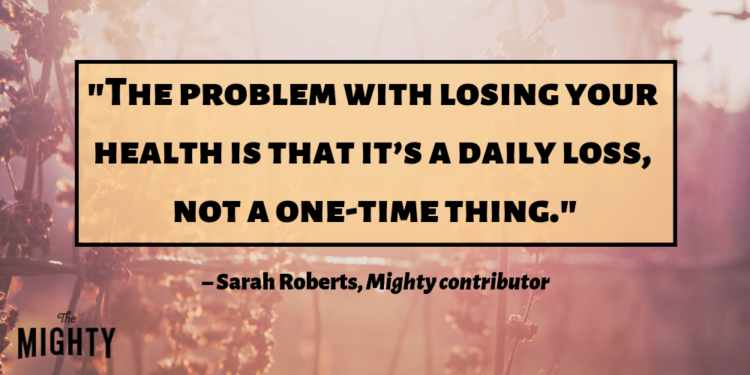 Though the grieving process is never linear, as Roberts explained, having an illness that constantly throws curveballs your way can complicate the process, and make it challenging to definitively “work through.” However, that certainly doesn’t mean it’s impossible to process your grief and get to a better place mentally and emotionally. Pratt said the first step toward dealing with grief is simply being aware of the process and how it affects you individually. The traditional five stages of grief, as described by Elisabeth Kübler-Ross, include denial, anger, bargaining, depression and acceptance. You may or may not move through each of the stages, or you may jump around between them. While some may identify with the traditional five stages, Pratt said it’s perfectly OK if you don’t. As a therapist, Pratt often helps people adapt the traditional stages of grief to their unique situation. “If you look at the typical stages of grief, you might go, ‘Ehh, I might experience some of that,’ but if it doesn’t apply to you or you can’t find a way to apply it to what you’re going through, it’s not going to be as meaningful,” Pratt explained. One example of how the stages of grief can be adapted is the seven psychological stages of chronic pain developed by Jennifer Martin, PsyD. 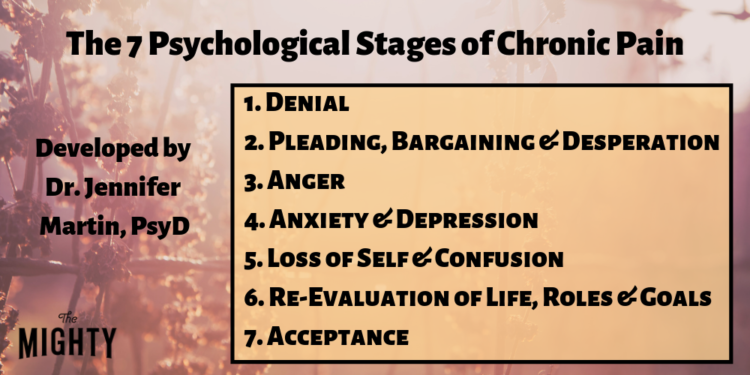 As a psychologist as well as a person with chronic illness, Dr. Martin found that Kübler-Ross’s five stages of grief didn’t quite account for all of the complex emotions those with chronic conditions experience. Between stage four, “anxiety and depression,” and stage seven, “acceptance,” Dr. Martin includes two “new” stages: “loss of self and confusion,” and “re-evaluation of life, goals and roles.” Even with these stages focused on the chronic illness experience, Pratt encourages people to further adapt the stages to their specific situation. Once you develop an awareness of the grieving process and what it looks like for you, Pratt said you can begin to identify where you’ve been, and where you are currently. Although everyone’s progression through grief is unique, remember that what you’re experiencing is completely normal. If you are struggling with grief because of your illness, it can be helpful to not only focus on coping specifically with the grief but to make sure you are working on managing and coping with your illness as a whole. Of course, there are countless components to coping with a health condition – and by no means do you need to have your health entirely under control before you can start working through your grief. But finding tools and strategies that help you live better with illness can certainly have an effect on your mental and emotional well-being, guiding you into a better position to navigate your feelings of grief. 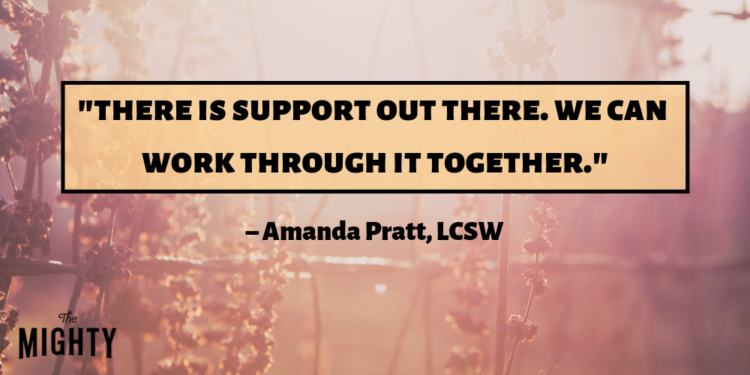 Pratt explained that there are three main areas she focuses on when providing support to those with chronic illness. While these practices can definitely apply to the grieving process, they can be helpful for anyone struggling with the general effects of illness. Long-term stress can have negative health effects for anyone – but when you have a chronic illness, the effects can be even more significant, as stress can exacerbate symptoms and trigger flare-ups. That’s why it’s especially critical for those with health conditions to try to keep their stress levels to a minimum. Even if you’re dealing with a major life stressor, such as living with a chronic illness, coping with the stress of it can, in turn, help you be in a better position physically and emotionally to manage the array of feelings illness brings up, including grief. One way Pratt recommended managing stress is by talking about it – whether it’s with a therapist or a trusted friend or family member. 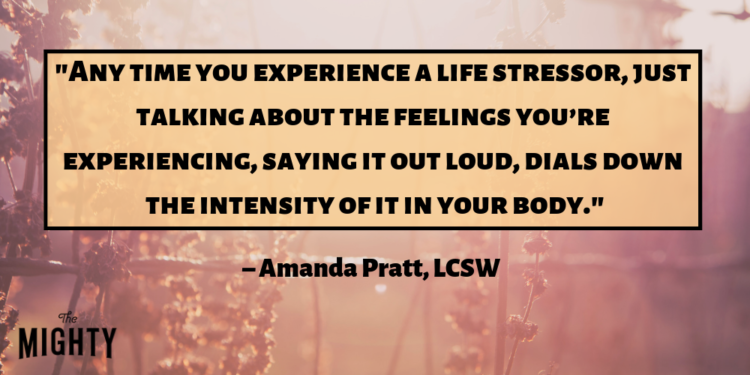 “Any time you experience a life stressor, research shows that just talking about the feelings you’re experiencing, saying it out loud, dials down the intensity of it in your body,” she said. A lot of illnesses, especially autoimmune illnesses, happen mainly to women, and one of the ways women tend to cope with stressors is, we tend to ruminate on the problem, we tend to over-analyze the problem. This is something I know I do. We just sit and we go, OK, this is the problem, I’m gonna think about it over and over again. But we don’t tend to shift as quickly to the solutions phase of that… Like, what is a solution? What’s one thing I can do today that’s going to help me? The second step Pratt recommends for coping with chronic illness and grief is keeping track of your physical health, mental health and daily activity – such as what you’re eating, or how much sleep you’re getting. Although the benefits of keeping a health diary are pretty intuitive, research also backs up the practice. A study published in the Journal of Rheumatology found that participants with chronic pain disorders who kept a health diary doubled their recall of daily symptoms, while a study of patients with cancer published in the Journal of Clinical Oncology found that the patients who reported their own symptoms using a tablet computer, rather than being simply monitored by physicians, experienced a higher quality of life. A Pew Research Center poll found that tracking symptoms led people with multiple chronic conditions to ask their doctors new questions or seek a second opinion, and had influenced a decision about how to treat their illness. Tracking your symptoms and activity helps you be more informed about your health, consequently allowing you to knowledgeably advocate for the care and treatment you need. “You’re gathering data, and that’s gonna help you make more informed decisions specific to you,” Pratt explained. While monitoring your health may help you manage your symptoms, it can take time, effort and lots of trial and error. Even then, it typically doesn’t translate to being able to “control” or “fix” your health, so don’t feel discouraged if you continue to struggle with symptoms and side effects. Sometimes, flare-ups or sudden declines in your health can happen seemingly randomly, which can naturally stir up feelings of grief. Still, being an active participant in your healthcare can help you better manage your condition(s) and find more effective coping strategies – for both your physical and emotional health. A critical component of coping with grief (and your illness altogether) is communicating your thoughts, feelings and needs. “I honestly think the biggest impact I see, and I know one of the things that helps me make a shift, is the importance of connecting with other people that you know understand what you’re going through,” Pratt explained. This could mean talking with a therapist, attending an in-person chronic illness support group, or connecting with others online who are experiencing similar struggles. Your therapist may not understand completely. Sometimes they might say something inaccurate or judgmental about your health that ticks you off. Please let them know. (I believe their reaction is usually a good measure of what kind of person they are – if they can handle feedback.) I don’t mean telling them off. You can just say, ‘My health is very personal to me. When you say (insert here), it makes me feel (ex: unheard, hurt, misunderstood).’ My main requirement is that my therapist tries. They don’t have to be perfect, but they do have to try to understand. Beyond trained professionals, Pratt stresses the importance of having a support system in your life, which could include attending a local support group, joining online communities or having several trusted loved ones you can talk with either on the phone or in person. “There’s research that shows that connecting with other people that are going through a similar experience is so healing in and of itself,” Pratt said. If you don’t feel like you have a support system, know The Mighty community is here for you. You can connect with other chronic illness warriors 24/7 to ask questions, share your experiences and get support (and we now have an app you can download to make this even easier!). Maybe you’ve been hit by a sudden flare-up or can no longer participate in an activity you loved doing when you were healthy. When feelings of grief strike – whether it’s anger or depression or a complicated mix of emotions – it can be challenging to know what to do with those feelings. Oftentimes, those feelings are difficult, and maybe ones we don’t really want to be feeling at all. Ignoring or denying your grief doesn’t mean it will go away forever, and learning to move through it doesn’t always come easily. 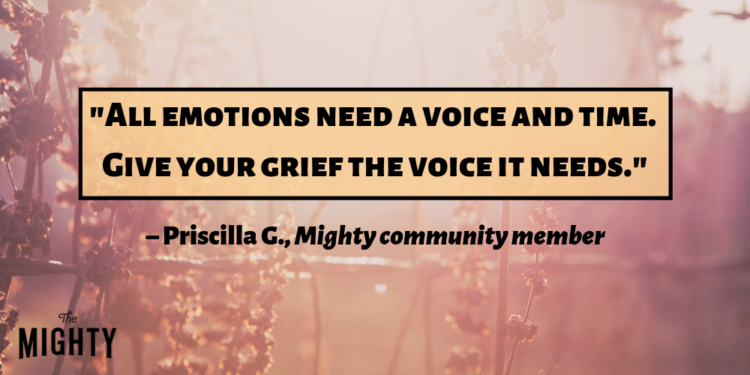 There’s no one better to turn to for real, practical coping tips than others with chronic illness, so we asked our Mighty community how they cope day-to-day with feelings of grief and loss. They shared the following practices to help others who might need a bit of guidance on those difficult days. In the midst of grief, it is natural and valid to be focused on what you have lost. But sometimes it can be helpful to practice turning your attention to the things you still have, or the parts of your “new” life you enjoy. This could be anything from loved ones, to your favorite TV show, to sipping a warm drink on a cold day. “Try your hardest to find even the smallest amount of joy in the little things and people around you. Even on the hardest days you still have hot showers, steaming tea, the weight of your blanket on you as you drift off to sleep, the smell of your favorite candle…” Bunny M. told The Mighty. It’s no secret that spreading kindness has the awesome side effect of making you feel good. Devoting even a small amount of your time to helping others can make a huge difference in someone else’s life, but it can also provide the giver with a sense of purpose and serve as a small reminder of all the good that exists in the world. Giving back could mean volunteering or donating to your favorite charity — but if chronic illness means these activities are off the table due to energy, physical abilities or finances, there are still so many creative options you can choose from. It could include writing a letter to a friend or providing virtual support to fellow chronic illness warriors in an online support group. “I try to do things for others. Sometimes it’s buying them a cup of coffee or I crochet someone a blanket when I am in bed for long amounts of time. It’s important for me to feel like I am still in this world,” Acadia M.M. said. Grieving is a natural effect of chronic illness for many people. It’s OK to let yourself feel all the complex emotions that come with it. 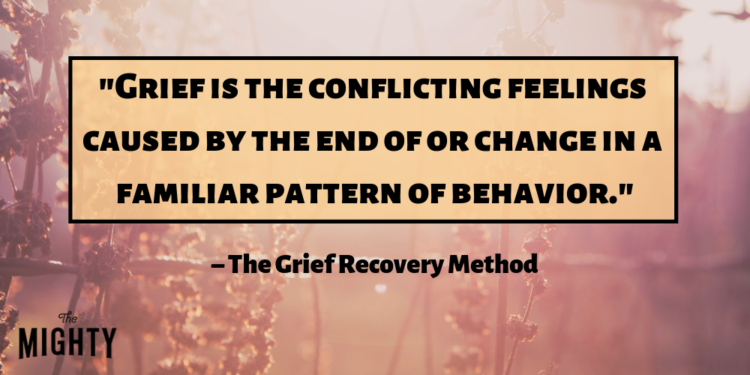 Grief may not exactly be “pleasant,” but acknowledging and accepting the process is an important step toward healing. There is also no expiration date attached to grief. This means it doesn’t matter if you have just been diagnosed or you have lived years with a diagnosis. Allow yourself to visit grief when you need to. The key word is visit! Don’t live in the emotions of grief, visit them, give them the voice and time they need, but, do not live there! We cannot live in grief. We need a full life, full of happiness and love. That includes love for yourself and your health. Many know the final stage of grief as “acceptance” – but what does acceptance look like when you live with chronic illness? How do you go about “accepting” a life that’s different than the one you envisioned? Pratt explained that “acceptance” doesn’t quite feel like the right word – a feeling echoed by many in the chronic community. “I feel like acceptance implies that someone offered and we accepted, and we aren’t given a choice,” she said. Instead, she prefers the terms “adaptation” or “integration,” as this is the stage where we learn how to integrate illness into our life and adapt to it in ways that allow us to still experience fulfillment. Grief often arises because our life and our future have been thrust in a different direction by chronic illness. During this stage, Pratt said, it’s important for us to work on reevaluating our life goals, creating a new identity (one that incorporates our illness) and prioritizing our health and self-care. We tend to think in such extremes. Sometimes people interpret it as something really negative. [I help] people find evidence in their life that there are opportunities here. There can be a silver lining to this. This is a shift we might be forced to make, but we can see the positive that comes out of it. By also considering what we have gained, we can begin to look forward and start charting a new path for our life with illness. Using her own experience as an example, Pratt explained how she had to completely change her career because of chronic illness, and find a job that allowed her to incorporate self-care while also doing what she enjoyed. Though this reevaluation process can certainly be difficult, that doesn’t mean it will have a bad ending. Chronic illness led Pratt down a different path than she anticipated, but because of her experiences, she now works as a therapist, helping others who face similar struggles – and that’s a pretty positive result. I started taking at least two minutes out of every day to focus solely on things for which I am grateful. I started giving myself credit for things I used to take for granted, like being able to get out of bed. I realized that in a way I was living life more fully than I ever had before, despite certain limitations. I know myself better and am more mindful of what I and others are experiencing in the moment. I additionally realized that parts of myself had improved, like being able to set better boundaries surrounding self-care. I was also better able to see who in my life was empathic, supportive and flat out willing to stick around. 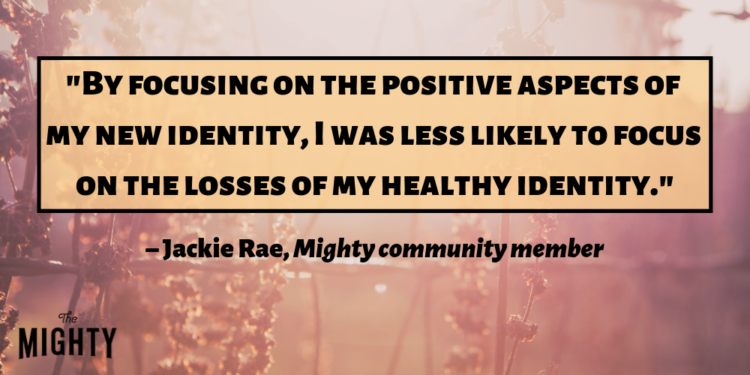 By focusing on the positive aspects of my new identity, I was less likely to focus on the losses of my healthy identity. Like chronic illness, grief can be a lifelong journey. It will likely change over time, as you cycle through the different stages and experience ups and downs in your health. Learning to cope with grief doesn’t mean learning how to make it go away. For some, coping with your grief might mean it becomes less intense over time, while for others, it means learning how to move through your day-to-day life with hope and purpose, even with the feelings of grief. Wherever you are with your grief, take a moment to recognize that your feelings and experiences are valid, and remind yourself that you are not alone in facing the challenges and changes life with chronic illness can bring. You are strong, you are valuable, and together, we can move through this. Want to connect with others who understand what you’re going through? Download our app to more easily talk with our chronic illness community.